In January 2007 Malcolm Turnbull, the man who would be prime minister, was appointed Environment Minister. He immediately supported the destructive policy of a 20 per cent renewable target for 2020. Needless to say, he was a fervent supporter of an equally destructive carbon tax. In his arrogance he saw fit to attack consumer choice by forcing Australians to buy expensive compact fluorescent lights in order to satisfy his sense of moral and intellectual superiority and statist mentality. To put it bluntly: Turnbull is an ignorant, egotistical and destructive man. His ludicrous approach to natural resources is another example of his witlessness and intellectual shortcomings and how he would further damage the Australian economy if given the opportunity. Turnbull publicly stated that raising the prices of resources would yield greater economic efficiency. This view revealed an incredible ignorance of economics as well as of economic history. Unfortunately Mr Turnbull is a typical example of the arrogance and economic illiteracy of the Liberal Party’s inner circle. What Turnbull did not or could not grasp is that greater economic efficiency means getting more for less. In other words, increased efficiency is another term for increased productivity. Allow me to phrase this in such a way that even an economic ignoramus like Turnbull can grasp it. Increased efficiency means falling unit costs. Thanks to a continuing increase in economic efficiency that entrepreneurial talent produced we have experienced a steady decline in the prices of natural resources. 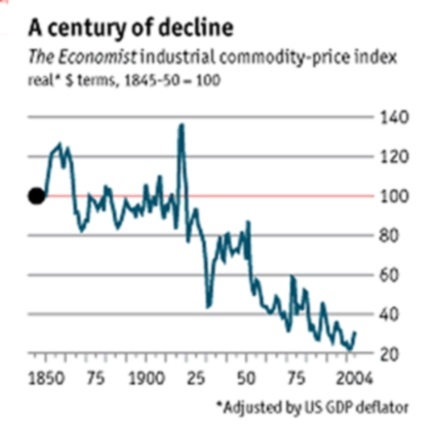 The above chart is The Economist’s inflation-adjusted industrial price index with 1845-50 = 100 as its base. One does not have to be a mathematician to see that by 2004 the index had dropped by 80 per cent. What needs to be noted is that the decline took place during a period of enormous industrial growth made possible by the industrial revolution that began in Britain and then spread throughout the West and then eventually into Asia. The first spike in the demand for commodities was probably the result of the California and Australian gold discoveries, after which prices fell and then became comparatively stable despite a significant increase in demand. The next spike was generated by WW I. Once the war was over commodity prices fell again. However, this was followed by plummeting prices caused by the Great depression. The next jump in prices was a product of WW II, after which they continued their secular fall. The likes of Turnbull could argue that this trend is unsustainable because resources are finite and that means prices must rise. This is an old greenie argument that has been discredited time and time again. For years the environmentalist doomsayer Paul Ehrlich had been predicting the emergence of massive shortages of natural resources, when he wasn’t also predicting global famine. In 1980 Julian Simon, an economist, offered Ehrlich a wage. Simon allowed him to choose any five metals worth $1000 and then bet him that in 1990 the value of these metals would have fallen in real terms. The metals chosen were copper, chrome, tungsten, tin and nickel. Come 1990 the prices of these metals had fallen in real terms by 18.5%, 40%, 57%, 72% and 3.5% respectively1. What arrogant economic ignoramuses like Turnbull seem unable to understand is that economic growth is also a resource-generating process. It not only leads to the discovery of new resources and the development of substitutes, the process of capital accumulation embodies technological progress. This means that more and more inferior grades of ore become economic to mine, making resources infinite from a human perspective. In other words, the quantity of resources becomes a function of price and technology. 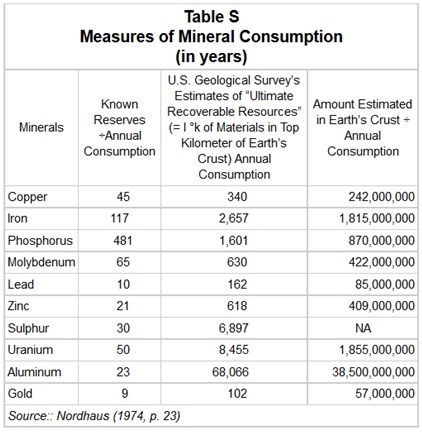 The following table tells us why running out of natural resources is the least of humanity’s problems. In 1389, in securing the crop of corn from two hundred acres, there were employed 250 reapers and thatchers on one day and 200 on another. On another day in the same year 212 were hired for one day to cut and tie up 13 acres of wheat and one acre of oats. At that time 12 bushels to an acre were considered an average crop, so that 212 persons were employed to harvest 168 bushels of grain, an operation which could be accomplished with ease in our time by half-a-dozen persons2. Look at our vast fields. All those crops, right to the horizon. See all that? Mulch it and ferment it and you have a sea of ethanol, a green petrol for the future3. As arrogant and as conceited at ever Malcolm Turnbull still refuses to condemn the RET (renewable energy target), a policy that would do enormous damage to the standard of living. Unable to grasp the fact that so-called renewables cannot work because of the insurmountable natural and economic obstacles they face he still dogmatically adheres to the greens’ party line. But what can we expect from a man who thinks that the way to make an industry more efficient is to raise its costs of production. Australians have enough to contend with without having to suffer the consequences of this man’s idiocy. 1Julian Simon, Population Matters: People, Resources, Environment & Immigration, Transaction Publishers, 1993, pp. 378-80). 2Edwin Cannan, The History of the Theories of Production and Distribution from 1776 to 1848, Staples Press, 1953, p. 137). 3Andrew Bolt, Reap the good oil, Herald Sun, 11 August 2006. Bolt’s knowledge of basic economics is on par with his ignorance of economic history. He went ga-ga over Sinclair Davidson’s views on Australia and the Great Depression, by doing so he grossly, albeit unintentionally, misled his readers. When it comes to economic history, and the Great Depression in particular, it would be very unwise of anyone to put too much store in Davidson. I’ll never forgive turnbull for forcing those awful fluorescent lights on us. The creep acted like a dictator. I feel the same way, Sarah. I also feel the same way about ethanol. I still remember Kennet trying to foist that one on us. I have to admit that I didn’t know that Bolt is so stupid that he thinks it’s a great idea to produce less food so that we can get more ethanol. I was surprised about Andrew Bolt supporting ethanol. I thought he was more intelligent than that. The link to Andew Bolt’s puff job for Sinclair Davidson should open your eyes. It’s been known in newsrooms for ages how reliant he is on the IPA. He used his spot on MTR to relentlessly promote Davidson and the rest of the crowd. Bolt gave listeners the impression that onlly several people in Victoria supported the free market and they were all backed by the IPA. The IPA must be happy with the support he gives them because they put his son on the payroll. Bolt probably thinks Mises is German for mice and Hayek is Japanese for yes. Well we disagree on a few things again. Firstly we did not have a carbon tax (which I favour ) we had an ETS. both are a great solution to an obvious externality. Markets will decide what occurs as they should. As I understand it about the only country where it is economically rational to have ethanol in petrol is Brazil . It isn’t here. So to be more accurate we agree on some things and disagree on some things however as always it is always enjoyable to read your thoughts. BTW. This was another example of the right’s backstabbing ways. Once they thought enough time had passed Alan Moran, Sinclair Davidson and Steve Kates came out of their holes to attack the carbon tax and alternative energy on basically the same grounds that gerry did. They did this without once mentioning Humhpreys paper or the Centre for Independent Studies. Lets face it, that lot will never do the right thing. I followed Sarah’slinks and they were very interesting. I don’t see how a rational person could disagree with Gerry’s argument, specially after what alternative energy did to Spain and is doing to Germany and the UK. Here is further proof that these ‘renewables’ are a financial failure and waste huge amounts of resources. Sorry but I disagree totally with Gerry on an ETS and Carbon tax. they are not the same but similar. If you believe in climate change which I do then it follows fossil fuels are not being costed correctly because of externalities. This is not a debate in economics as Pigou wrote about this eons ago..